But I had NO clue what that meant. What in the world could my coach do to help me get to the school I wanted to go to? I had no idea. So, I never told him where I wanted to go. I never told anyone actually. I did wonder, in my brain, how is THAT coach going to find out about me? But I never thought to ask anyone. I figured it would just happen if I played well enough. A rep from a college recruiting service came to talk to us AFTER my senior season was over and asked if we wanted some help. I don’t think they did a very good job of communicating the value of working with them because we left that meeting feeling like we didn’t really need the help. Or maybe it was just my ego in my way. Probably a little bit of both mixed in with lack of education on the process. I really had no idea, at that time, how much more I could’ve done to give myself more options, to give myself a chance at even being considered by the program I really wanted to go to. Yes, I did get offers, but only from schools right here in Hawai`i. A friend of mine however, did choose to work with this service. 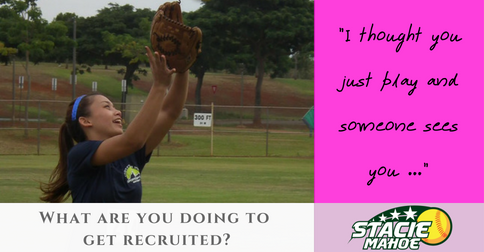 She was not even on a team that made the post season, barely even got state recognition for softball, but she got offers from schools outside the state. She went on to play multiple sports in college. Just like she wanted. In hindsight, I did wonder what that service might have been able to do for me, but it was too late. Thankfully, I did have offers from local schools, and I accepted a DI offer, but that doesn’t happen for all kids who don’t have a strategy, especially if they don’t have the luxury of being on a team in the spotlight. I thought, that in today’s world of hyper-connectivity and information at your fingertips, student-athletes would have MUCH more of a clue than I did over 20 years ago. I could tell she was feeling a bit overwhelmed and it was all just getting started! That’s when I realized that there are still a LOT of student-athletes, and their families, who don’t know anything more than I did way back when. I also when I realized that, when I work with families, it’s about a LOT more than college recruiting tasks and strategy. I am also there to support and encourage them along the way and keep things moving because, this journey, even when it’s going well, can get INtense! The last thing we want is a student-athlete to feel so overwhelmed and so stressed out and so discouraged that they give up on the whole thing entirely. I have seen this happen with my own eyes and I want to help reduce the chance of this being the reason opportunities are missed for your child. … and that’s how you get recruited. OR they know there’s gotta be more, but don’t know what that entails exactly. Now, can it happen that way for some athletes? They just show up, play, someone sees them, and offers fall in their lap? For a very elite few, it could happen that way. But for MOST? That is NOT how it’s gonna go down. If the “just show up and play and someone will see me” concept has been your entire strategy up to this point, or if that’s all your child thinks is involved in this process, contact me ASAP. We’ve got lots we need to talk about.